What does it look like to be fully responsible for yourself, including your action and inaction? Are you at all responsible for the shadow of men, even if you haven’t acted it out? How can you be a powerful, fulfilled man who courageously stands up for what he believes in? As a good man it can be challenging to know how, or what, to take responsibility for these days, especially in the cultural context of the Metoo and Time’s Up movements. But what if this was a call to step into more responsibility and with it more power? True power! Taking responsibility is a mature and powerful stance that can change your life. Letting go of the idea that “life happens to you” and seeing that, in many ways, you are creating your life is eye opening. You don’t have to claim to have done something you haven’t done, but there are deeper layers of looking at your part in a dynamic. And a willingness to consider, if you haven’t played a role with your actions, whether you have with inaction. 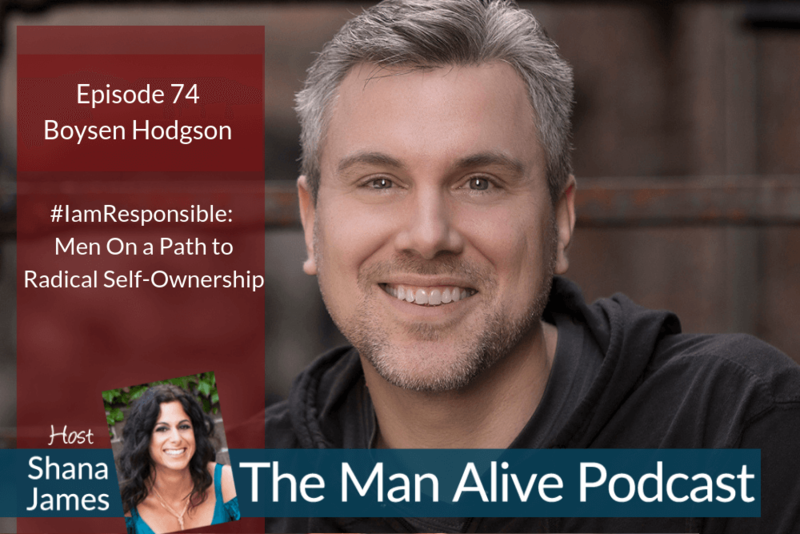 Boysen Hodgson, Communication Director for the Mankind Project, joined me for this Man Alive episode to discuss the #IAmResponsible movement. MKP is committed to individual and collective evolution, and supports men to take responsibility for creating the society they want to live in and share for the generations to come. They believe men can take responsibility for the GOLD and the SHADOW of masculinity, as creators and role models, victims and perpetrators. This is an important conversation to have. I believe it wakes us up and makes new levels of connection and fulfillment possible, when we are willing to be courageous and look deeper into ourselves! Boysen Hodgson is the Communications Director for the ManKind Project USA, part of a global brotherhood of nonprofits conducting transformational initiation programs for men at every stage of life, and supporting a network of men’s groups serving over 10,000 men every week. He’s the author of “The New Macho,” a credo for the mature masculine shared over 50,000 times and published in numerous blogs, magazines and books. His mission is to transform culture by designing change and building bridges. Boysen completed the New Warrior Training Adventure in April 2004 and has been working with men ever since, supporting and challenging them to break out of isolation, take responsibility for their emotional riches, and live their full potential … starting with himself. He’s dedicated to nurturing the powerful, emotionally aware, accountable, and purpose driven men we need to help heal our society’s deepest wounds. He is an urban homesteader, a husband, and a proud papa.